Parkinson’s disease is a chronic, progressive disease that affects the nervous system and causes symptoms such as shaking, tremors, weakness, changed speech, and depression. This disease can be difficult to manage, and many seniors will require assistance from a Parkinson’s caregiver in Guelph. Doctors are still unsure what causes Parkinson’s disease. However, studies have shown there are some lifestyle changes your senior loved one can make that may reduce the risk of developing the condition. The Mediterranean diet has been associated with reduced risk for developing a number of serious conditions seniors face, including heart disease, Alzheimer’s, and Parkinson’s. Researchers suggest the diet is effective at preventing diseases because it is extremely healthful for the body. The Mediterranean diet is abundant in vegetables and fruits that are high in fiber and nutrients your loved one’s body needs. It is also rich in sources of lean protein, substituting fish and other lean meats for protein needs and avoiding processed and red meats, which are less healthful. The fish, olive oil, and nuts included in the diet are good sources of omega-3 fatty acids and other healthy fats. An hourly or live-in caregiver in Guelph can help your loved one manage a healthy diet such as this one. 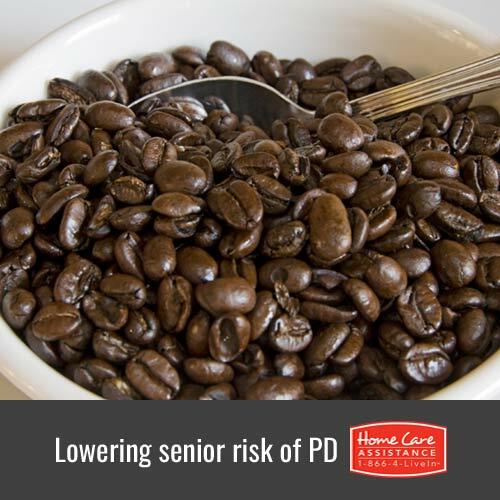 Caffeine has been shown to have a positive effect on preventing Parkinson’s disease. Your loved one may be surprised to learn a cup of coffee or tea can have health benefits he or she was unaware of. Like many other foods and beverages with potential health benefits, caffeine should be consumed in moderation. Drinking tea, especially green tea, is one of the healthiest ways to get caffeine. Green tea has also been shown to benefit memory and energy. Suggest your loved one switch to green tea if he or she doesn’t already drink it. While we need iron for our bodies to function effectively, having a higher than average level can be dangerous. Your loved one should be tested occasionally for high levels of iron to prevent an overload in the system. Iron and manganese have been linked to oxidative stress, which is the production of free radicals that age our bodies. The damaged brain cells found in seniors with Parkinson’s disease are often high in free radicals and have undergone oxidative stress. Therefore, it’s a good idea for your loved one has a blood test to make sure iron and manganese levels are under control. Many chemicals and herbicides are now being linked to the development of Parkinson’s disease in individuals who were exposed to them. One source of dangerous chemicals is petroleum-based hydrocarbon solvents, which can be found in paint. While painting isn’t dangerous, if your loved one’s house is being painted, low-volatile paints and proper ventilation should be used. Make sure your loved one stays inside during processes such as crop dusting or fogging for West Nile since these pesticides contain extremely high doses of dangerous chemicals linked to the development of Parkinson’s. Though preventive measures can reduce your loved one’s risk of Parkinson’s, no single method is foolproof. If your loved one has been diagnosed with the disease, he or she may need assistance from a professional caregiver. For home care Guelph families can rely on, turn to Home Care Assistance. Our caregivers can assist your loved one with mobility, medication management, grocery shopping, and many other daily tasks. For more information, please call one of our qualified Care Managers at (519) 954-2111 to schedule a free consultation. What Should a Senior Drink Instead of Soda?